Whova's New Design Templates for Event Agenda Webpages - Find the One You Like! Okay, so you have an event coming up soon, and you need a professional-looking web page for attendees. You want something fast, easy to create and browse. Except, you think you need some HTML skills, some design talents, and tons of time to adjust. But what if that wasn’t true? 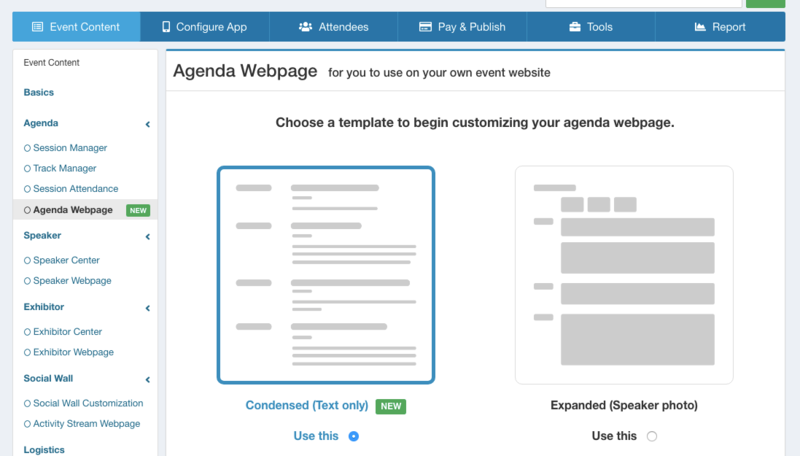 You might have already heard about Whova’s Agenda Webpage – you can automatically create an event agenda webpage from a spreadsheet. Now we are delighted to announce a new feature on it – multiple design options! You can easily play around with different designs and select one that looks and feels perfect for your event. Whichever design you choose, it will be stylish and interactive so that it feels like being made by a professional web designer. The best part is that this tool is offered at no additional charge for our Whova app customers. What is Whova’s Agenda Webpage? 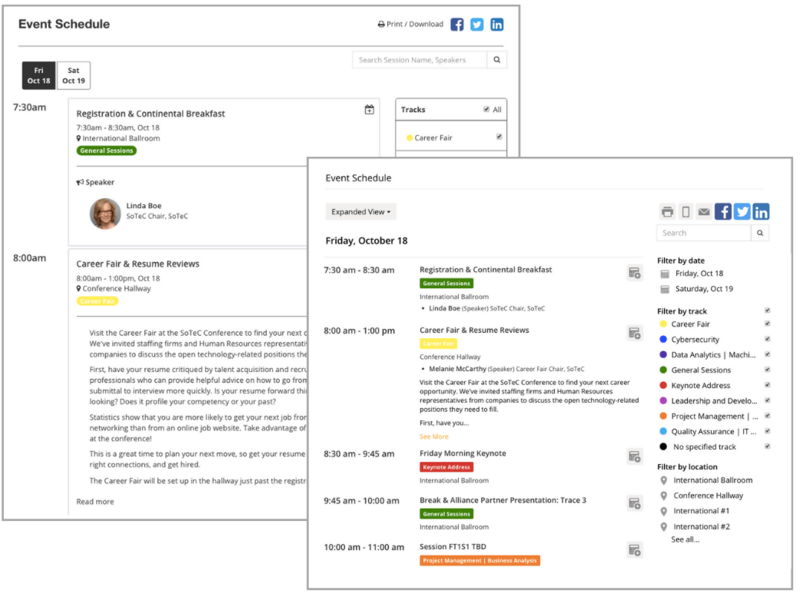 Whova takes event agenda information in a spreadsheet and turns it into an agenda webpage and mobile agenda (in the Whova event app). In seconds, you can have a customized agenda web page that looks like you spent days and nights. It’s easy to embed it into your event website by one line of copy & paste. The webpage automatically syncs with your mobile agenda so you can manage everything in one place, the Whova dashboard. The Agenda Webpage now comes with multiple design templates. First, the Comprehensive Design provides all your session information right on the screen, including the entire session abstract and speaker photos. Some organizers think it looks well organized in a table format and can highlight speakers with their photos. It’s visually attractive and also informative. On the other hand, the new Text-Only Design would be a good option for a complicated agenda with lots of speakers, concurrent sessions or multi-tracks. It presents information into bite-sized chunks and hides speaker photos, making a lot of information accessible to digest and find. For a long session abstract, it only shows the preview. The agenda webpage is interactive. 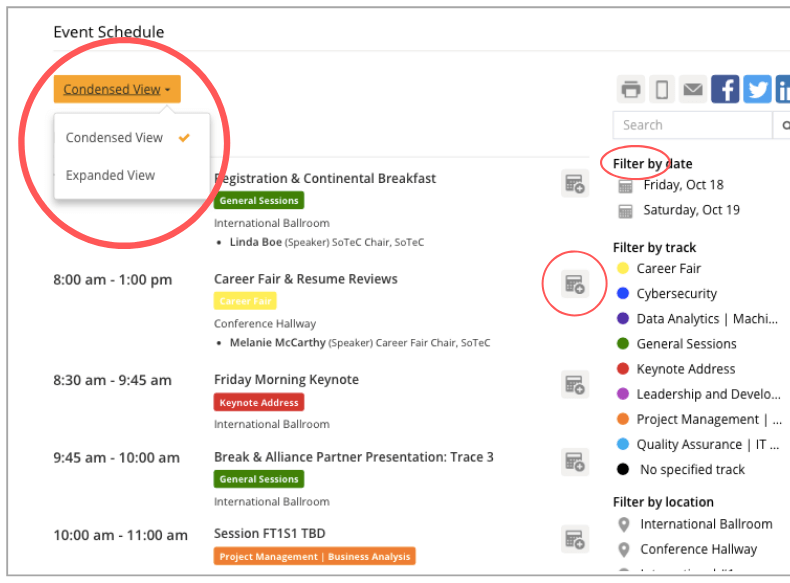 Attendees can filter event sessions by date, track, and location and search by any keywords. Going one step further, attendees can now further condense the agenda by hiding all the session abstract from the Text-Only design. This is handy when they want to quickly double check a complicated and lengthy schedule at a glance. Attendees can also choose a session to save it into their own calendar. The design choices are super functional, crisp, and easy to implement, without needing to spend lots of creative energy. But if you want to have more control in details, such as a font type, size, color, title of the agenda section, etc., you can go ahead and tune each element as you wish. Whova provides the full customizability. How to Rock the New Design Choices? Whova App will convert your event information into an agenda including session details, speaker information, and more. With one line of copy and paste, you can seamlessly embed the web agenda into your event website. Or, you may keep it as a standalone web page and add the link in your event website. When you need to make changes, you do this in the Whova dashboard, and your Agenda Webpage is automatically updated. Having a stunning agenda webpage is only one part of your event website. With Whova, you can create speaker list and bio pages, sponsor and exhibitor web pages, online ticketing page, and more. All of this can be created with Whova’s Website Builder, so check it out. Would you like to see some real event websites built by Whova’s Agenda Webpage? Interested in seeing how it works with the Whova app and how easy it is to set up? Contact us to request more information.